“George Geyer’s sculpture toys with the mind,” explained the late distinguished museum director and educator Henry Hopkins. “What we know and what we see are two different things. 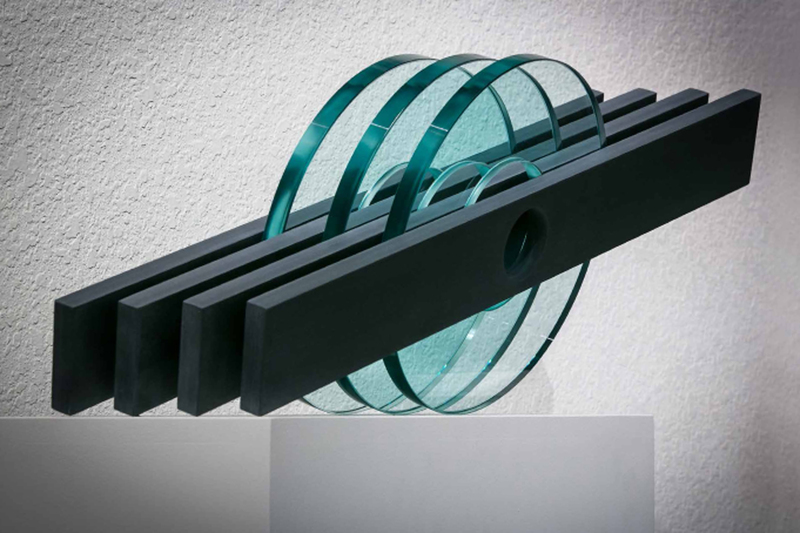 Translating scientific knowledge of material strength to art, [Geyer] confuses our senses by making glass flow like water.” In his hands, stone, wood, glass and metal taunt and tease the limits of natural laws. Trial and error, rethinking and reconstructing are Geyer’s tools. Geyer’s 1978 first site specific sculpture installation, Tidal Erosion, fused salt water and tidal flow with unfired clay. A collaboration with Tom McMillin in 1981 produced Surf Line Erosion. Writing in Visions Magazine, David Helfrey described the work as an “exemplar of his process-oriented environmental site pieces…doomed to success.” Double Concave Gravity Bend X is minimal and industrial and tests the potentially dangerous properties of the force of gravity. Geyer and McMillin worked on an installation for the exhibition Time, Space and Matter, opened at the Pasadena Museum of California Art May 2014. George Geyer earned his BA at San Diego State University and MA at UCLA. He is widely exhibited and his work is in major collections. The interview was sponsored by John and Cherie Brant. The AfterGlow was hosted by David & Linda Elder and Tom & Gerri McMillin.